My favorite thing about NC State is definitely the academics, and the most extraordinary thing has been witnessing and being part of a community of people with so much pride in our school. There is nothing like cheering in Carter-Finley Stadium. Every time we get to run out and I’m standing in the middle of the field surrounded by over 50,000 people, it feels surreal. I cherish moments like this and I will forever hold NC State in my heart. I grew up always staying active, playing two or even three sports at a time, up until my junior year of high school. That’s when I chose just to cheer. I decided to attend NC State University because I was looking for a big, but welcoming, school outside New York. 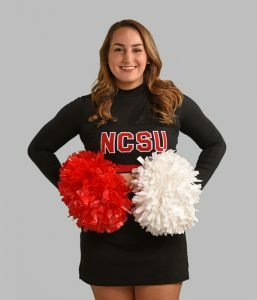 I wanted to go down south, and NC State seemed to have everything I was looking for: a comforting atmosphere, good academics and strong cheerleading. I’m an only child and I have a dog here in North Carolina – a mini Australian shepherd named Nala. I am going into my 14th year of cheerleading this fall – I started when I was 8 years old. I knew that NC State had a very successful program and I wanted to surround myself with hard-working people doing the sport I love. The most memorable times I’ve had as a Wolfpack cheerleader include last year’s football game at Clemson, and winning both NCA nationals as a team and UCA group stunt nationals in 2016. Every game day, before we get off the bus to head to the walk of champions, we do a team chant that ends with us howling. It sounds silly, but it really pumps up the morale. Thinking back to my first game at Carter-Finley, the national anthem made the biggest impression. Hearing the crowd literally scream “red” and “home of the Wolfpack” gave me so much pride. I couldn’t help but get chills when the flyover happened at the end. To this day, I get those chills every time. We started preparing for football games the first week of school. There are around 50 cheerleaders on our team and we all cheer at football, so that’s a lot of organization. We practice about three times a week for three hours at a time. The biggest challenge is making sure our stunts and pyramids are 100 percent solid and sharp, and give off a sense of “making it look easy” (when they truly are not). We practice hard to build up our skill sets so that each performance is more difficult than the last. One of my favorite parts of a game is the start of the fourth quarter during a close contest. When our “fourth quarter, let’s go” chant starts, it really gets everyone super motivated to give that last push of energy. Plus, the chant gets the fans hyped up and I love watching the crowd get excited. Another favorite is performing our pyramids during timeouts. Every time we stack our flyers two-and-a-half high, you can hear a reaction of amazement in the background. It makes me feel good to know our hard work is appreciated. Getting a scholarship of any type for cheerleading definitely influenced my decision to come here, as I am an out-of-state student paying out-of-state tuition. The scholarship also has influenced my college experience because it is talent-based and has made me work harder and always give my best. I loved the exploratory studies major where I started as a freshman. I didn’t know exactly what I wanted to go into, and that program allowed me to explore majors and gave me the guidance to pick one that I truly love. At a College of Sciences event, a student talked to me about the integrative physiology and neurobiology concentration in the biological sciences major. I was extremely interested in the research topics and classes involved and decided I would strive to transfer into the major. Because of having been so active in sports, I am very interested in learning how the brain and body work together to allow us to do unbelievable things. After graduation, I would like to go into research focused on signal transduction and receptor pharmacology, which is focused toward finding treatments for human disease caused by problems in intracellular communications. If possible, I hope to earn a master’s and Ph.D. in medical neuroscience. NC State is bringing me much closer to realizing my goals. The classes here help introduce you to your possible future, preparing you for jobs and real-world experiences.